This recipe blew me away while I was testing for Hearty Vegan. Matthew isn’t a fan of sweet potatoes, so when he was away recently and I had some time to spend cooking just for myself, I knew what I’d be making. If you make all the components (and you definitely should), this is a bit time consuming, but you can stagger the stages so it isn’t all last minute. You’ll bake, then bread and fry the sweet potatoes and serve them a fennel marmalade, aoli and the sweet peppercorn coleslaw. The sweet potato breading and the aoli both contain Old Bay, which is one of my favourite things, and the sticky sweet fennel goes so well the black pepper in the coleslaw. There are lots of recipes I absolutely adore in Hearty Vegan so for one to emerge as my favourite it has to be very special. And believe me, this is. This entry was posted in Hearty Vegan by efcliz. Bookmark the permalink. Looooove that recipe and Hearty Vegan Meals! oohh… I just got that book not long ago but haven’t actually used it (haven’t actually cooked in a couple of months – we are fixing up/moving in to a new house that was a foreclosure so we seem to spend all our time working on the house and, as a result, we eat on the fly – but I am looking forward to it again someday soon). I know want to try this. 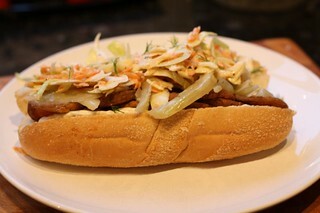 My husband used to live in New Orleans for a time so I am interested in getting his feedback on this po’boy. You say you adore this book so can you name your top ten (or twenty…or whatever! 🙂 ) faves so I can be on the lookout for them?